Summary: The overall aim of this project is to obtain a better understating of the cumulative exposure of marine turtle nesting grounds to coastal construction to infer potential impacts and inform management practices. Spatial data is available through the Florida Department of Environmental Protection (DEP) on coastal construction permits, from 1980 to 2016, that have been issued throughout the state of Florida. This data will be categorized, verified, and analyzed to provide a historical summary of permitted construction activities (beach sand placement, beach armoring, other shoreline stabilization, sand fences, dredging, stormwater outfalls, channel and bridge blasting, beach cleaning, special events and light pollution), where the spatial and temporal variability of permits is explored. Our approach will be ground-truthed, using the Panhandle as a case study. For this the PI will traverse the Panhandle and collect information (location, description and photo) on coastal construction and permitted activities. The verification of the constructed projects will then be used to determine the accuracy of the DEP database of permitted projects and to explore whether permits can be used as a proxy for coastal construction. A detailed summary and maps of the exposure of marine turtle nesting grounds to coastal activities and associated spatial and temporal patterns will be developed. Results: Data (GPS locations, photographs, descriptions) were collected throughout the Florida panhandle from May through early September. Obtaining authorized access to the military installations (Eglin, Tyndall, and Cape San Blas AFB) proved difficult. Due to the low amount of coastal construction in these areas they were excluded from the ground truth portion of this study. The amount of time to cover the beaches of panhandle (approximately 200 miles) exceeded the budgeted time of 14 days and required approximately 21 days. The additional days were accomplished through day trips to beaches in Wakulla, Franklin and Gulf Counties from Tallahassee. Two beaches that required boat for access but had limited construction data (Cape Saint George and St. Vincent NWR) were not traversed by the PI but the lack of construction or limited data collection was verified by the management staff of these two areas (ANERR and SVNWR). Coastal areas are used by both marine turtles and humans, which may result in marine turtle nesting grounds being exposed to human activities like coastal construction. Several studies have investigated the effects of specific types of coastal construction on marine turtles and their habitat. However, limited information exists on cumulative exposure of nesting grounds to coastal construction. This project examines the spatial and temporal exposure of 203 marine turtle nesting grounds in Florida to coastal construction. For this we used coastal construction permits issued from 1985 through 2016 as a proxy for coastal development. 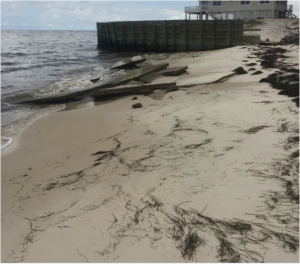 After our initial assessment 34 marine turtle nesting beaches in the Florida Panhandle were ground truthed to determine the presence of coastal construction and correlation with issued permits to test the suitability of the database as a proxy for coastal construction. The construction types analyzed were 1) coastal construction landward of dune, 2) coastal construction in dune, 3) coastal construction on beach, 4) coastal construction in water, 5) beach armoring, 6) other shoreline stabilization, 7) beach sand placement, 8)beach cleaning, 9) light pollution, 10) sand fencing,11) special events, and 12) stormwater outfall. The most common permit type was coastal construction landward of the dune (64%), followed by coastal construction within the dune (21%). The cumulative number of permits for the state of Florida increased over time between 1985 and 2016 from less than one thousand permits issued per year to over four thousand permits issued per year. 93.5% of the nesting beaches examined throughout the state were exposed to cumulative coastal construction. Of the high density nesting beaches, twenty six had high exposure to coastal construction, whereas fifteen had low exposure to coastal construction. The latter were adjacent to state and federally owned properties. The study highlights the need for conservation strategies to consider the cumulative impacts of coastal construction to marine turtle nesting grounds.